Easton Neitzel looked like he was shooting on a bigger rim than everyone else. 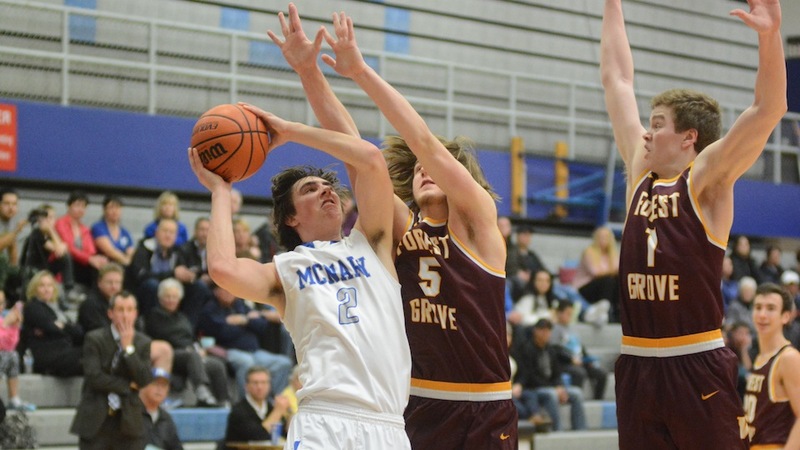 The McNary senior had a career high 30 points as the Celtics defeated Forest Grove 86-68 at home on Tuesday, Jan. 3. Neitzel’s 30 points included four 3-pointers. He also went 6-for-6 from the free throw line. McNary also nearly got a triple-double from Matthew Ismay. The senior finished with 14 points, 10 rebounds and seven assists. Chandler Cavell gave the Celtics a spark off the bench in the first quarter. The junior had 10 points but Forest Grove led 23-21. McNary took control in the second quarter, scoring the first seven points and outscoring the Vikings 24-9 in the period to take a 45-32 lead into halftime. Ismay picked up his third foul just 30 minutes into the second half and was forced to the bench. However, he didn’t stay there long as Forest Grove pulled within 45-39 with 5:32 remaining. Neitzel made back-to-back 3’s and went 4-for-4 from the free throw line in the final three minutes of the third quarter as the Celtics held on to a 65-54 lead. The Vikings opened the fourth quarter with two 3-pointers and a free throw to get within 65-61. However, Forest Grove couldn’t get any closer as Cade Goff and Ismay scored on back-to-back possessions to stretch the lead to eight. McNary made its final nine free throws to put away the Vikings. “We play in the toughest league and just getting one win is so difficult. It’s exhausting,” Kirch said. Playing on the road, McNary senior Sydney Hunter made a 3-pointer at the buzzer as the Lady Celts escaped Forest Grove with a 43-41 victory. Hunter finished with 18 points and nine rebounds. Jaylene Montano added seven points as McNary outscored the Vikings 12-5 in the fourth quarter. McNary travels to West Salem Friday and then hosts Sprague in a make-up game on Saturday. Girls tip off at 5:45 p.m. followed by the boys at 7:15.